A new poll predicts that comic actor Volodymyr Zelenskiy, a political novice who plays a fictional president on TV, is likely to win in Ukraine's presidential election. The poll by Reiting is the first to survey the potential outcome of Ukraine's presidential election second round, and it shows Zelenskiy on 61 percent of votes and incumbent Petro Poroshenko on 24 percent. 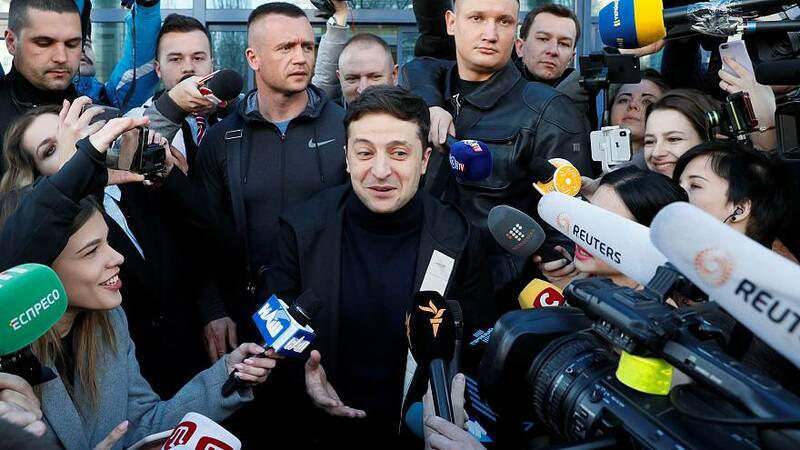 Zelensky, a successful actor and producer, has led an unconventional campaign aimed at engaging voters on social media. In a case of art potentially imitating life, he played the Ukrainian president in a popular TV show. Zelensky, 41, didn't hold rallies, instead travelling around the country selling tickets to gigs at which he parodied many of the politicians he is running against. He has pledged to tackle corruption, stop a brain drain out of the country and make Ukraine "prosperous" again. He has also previously said that if elected he will only serve for one term. Voters in the historically Russian-speaking southeastern regions of Ukraine could be crucial for Zelensky, who is a native Russian speaker. Whoever wins the vote will inherit conflict between Ukrainian troops and Russian-backed separatists in the East, after the 2014 Maidan street protests forced out the former pro-Russian President Viktor Yanukovych and Russia annexed the Crimean peninsula. Ukraine's economy also hangs in the balance and the next leader will decide whether to enforce the reforms required to keep the country in an International Monetary Fund bailout programme.